The British company G'S FRESH GROUP has presented Fruit Logistica with a new range of healthy snack foods that it will launch on the European market. 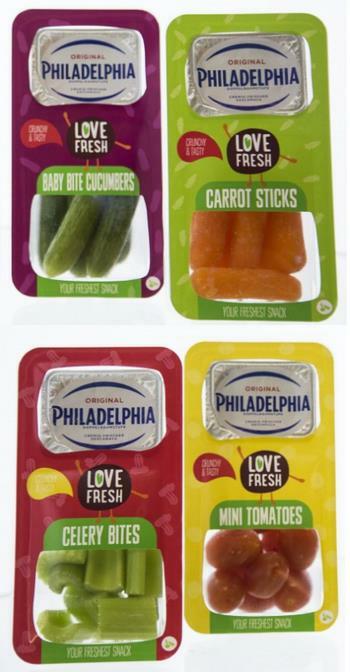 Under the LOVE FRESH brand, this range includes ready-to-eat vegetables and a portion of Philadelphia fresh cheese. This new range reflects the evolution of eating habits. If consumers eat less during their meals, they nibble much more. According to studies conducted by the company, 96% of people eat between meals and 69% do it daily. But only 39% of people choose healthy options. "Today, it is still difficult to find healthy products to snack between meals, and we would all like to eat more fruits and vegetables by combining these two ideas and following consumptopm trends and habits. We wanted to offer vegetables to consumers but in a fun and practical way "said Aurélie Zgheib, Director of the global brand LOVE FRESH. These snacks contain a serving of 80 grams of ready-to-eat vegetables and a 35 gr serving of Philadelphia fresh cheese. The range offers 4 varieties: mini cucumber, mini tomato, celery, carrot. The new LOVE FRESH range. Vegetables and fresh cheese, portions suitable for snacks between meals.